Much of the City of Superior, Wisconsin was built over heavy red clay soils associated with the historic bed of Lake Superior. These soils are virtually impervious to water, and as a result, wetlands have developed in virtually all flats, swales and depressions. According to inventories completed in the City, approximately 75 percent of undeveloped land is wetland. This abundance of wetlands resulted in extreme challenges as the City attempted to plan for future growth. To address this issue proactively, a Special Areas Management Plan (SAMP) was initiated in the early 1990s. The purpose of the SAMP was to assess and prioritize areas for development, with special consideration given to potential impacts to wetlands and rare plants. 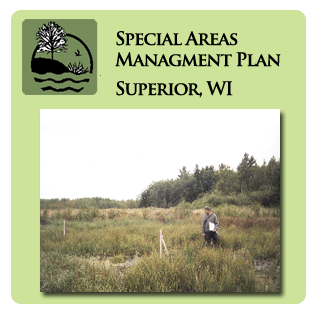 Kjolhaug Environmental Services Company, Inc. (KES) began the project by completing an assessment of more than 15 potential development sites for wetlands and rare plants. An additional 15 sites were evaluated for use as a wetland bank, and prioritized based on feasibility of ecologically significant and cost effective wetland restoration and creation. These sites were utilized to develop a concept wetland mitigation and banking plan for creating up to 200 acres of wetlands, and preservation and management of an additional 150 acres of significant uplands and wetlands. The plan was approved by wetland regulatory agencies in 1996 and is currently guiding land use decisions within the City.